For other uses, see Edward Bellamy (disambiguation). Edward Bellamy (March 26, 1850 – May 22, 1898) was an American author and socialist, most famous for his utopian novel, Looking Backward, a tale set in the distant future of the year 2000. Bellamy's vision of a harmonious future world inspired the formation of at least 165 "Nationalist Clubs" dedicated to the propagation of Bellamy's political ideas and working to make them a practical reality. 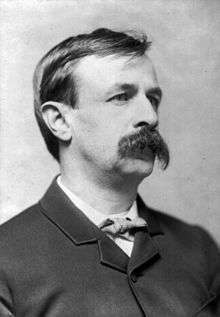 Edward Bellamy was born from his motherChicopee, Massachusetts. His father was Rufus King Bellamy (1816–1886), a Baptist minister and a descendant of Joseph Bellamy. His mother, Maria Louisa Putnam Bellamy, was herself the daughter of a Baptist minister named Benjamin Putnam, a man forced to withdraw from the ministry in Salem, Massachusetts, following objections to his becoming a Freemason. Bellamy attended public school at Chicopee Falls before leaving for Union College of Schenectady, New York, where he studied for just two semesters. Upon leaving school, Bellamy made his way to Europe for a year, spending extensive time in Germany. Bellamy briefly studied law but abandoned that field without ever having practiced as a lawyer, instead entering the world of journalism. In this capacity Bellamy briefly served on the staff of the New York Post before returning to his native Massachusetts to take a position at the Springfield Union. At the age of 25, Bellamy developed tuberculosis, the disease that would ultimately kill him. He suffered with its effects throughout his adult life. In an effort to regain his health, Bellamy spent a year in the Hawaiian Islands (1877 to 1878). Returning to the United States, Bellamy decided to abandon the daily grind of journalism in favor of literary work, which put fewer demands upon his time and his health. Bellamy married Emma Augusta Sanderson in 1882. The couple had two children. Bellamy's early novels, including Six to One (1878), Dr. Heidenhoff's Process (1880), and Miss Ludington's Sister (1885) were unremarkable works, making use of standard psychological plots. A turn to utopian science fiction with Looking Backward, 2000–1887, published in January 1888, captured the public imagination and catapulted Bellamy to literary fame. The publisher of the book could scarcely keep up with demand. Within a year the book had sold some 200,000 copies and by the end of the 19th century it had sold more copies than any other book published in America up to that time except for Uncle Tom's Cabin by Harriet Beecher Stowe and Ben-Hur: A Tale of the Christ by Lew Wallace. He also collected several short stories in 1898 and published The Duke of Stockbridge; a Romance of Shay's Rebellion in 1900. Although Bellamy retrospectively claimed he did not write Looking Backward as a blueprint for political action, but rather sought to write "a literary fantasy, a fairy tale of social felicity", the book inspired legions of inspired readers to establish so-called Nationalist Clubs, beginning in Boston late in 1888. Bellamy's vision of a country relieved of its social ills through abandonment of the principle of competition and establishment of state ownership of industry proved an appealing panacea to a generation of intellectuals alienated from the dark side of Gilded Age America. By 1891 it was reported that no fewer than 162 Nationalist Clubs were in existence. Every sensible man will admit there is a big deal in a name, especially in making first impressions. In the radicalness of the opinions I have expressed, I may seem to out-socialize the socialists, yet the word socialist is one I never could well stomach. In the first place it is a foreign word in itself, and equally foreign in all its suggestions. It smells to the average American of petroleum, suggests the red flag, and with all manner of sexual novelties, and an abusive tone about God and religion, which in this country we at least treat with respect. ...[W]hatever German and French reformers may choose to call themselves, socialist is not a good name for a party to succeed with in America. No such party can or ought to succeed that is not wholly and enthusiastically American and patriotic in spirit and suggestions". Bellamy himself came to actively participate in the political movement which emerged around his book, particularly after 1891 when he founded his own magazine, The New Nation, and began to promote united action between the various Nationalist Clubs and the emerging People's Party. For the next three and a half years, Bellamy gave his all to politics, publishing his magazine, working to influence the platform of the People's Party, and publicizing the Nationalist movement in the popular press. This phase of Bellamy's life came to an end in 1894, when The New Nation was forced to suspend publication owing to financial difficulties. With the key activists of the Nationalist Clubs largely absorbed into the apparatus of the People's Party (although a Nationalist Party did run candidates for office in Wisconsin as late as 1896), Bellamy abandoned politics for a return to literature. He set to work on a sequel to Looking Backward titled Equality, attempting to deal with the ideal society of the post-revolutionary future in greater detail. The book saw print in 1897 and would prove to be Bellamy's final creation. Edward Bellamy died of tuberculosis in Chicopee Falls, Massachusetts. He was 48 years old at the time of his death. His lifelong home in Chicopee Falls, built by his father, was designated a National Historic Landmark in 1971. Bellamy was the cousin of Francis Bellamy, famous for creation of the Pledge of Allegiance. Bellamy Road, a residential road in Toronto, is named for the author. "To Whom This May Come"
↑ Franklln Rosemont, "Bellamy's Radicalism Reclaimed", in Daphne Patai (ed. ), Looking Backward, 1988-1888. Amherst MA: University of Massachusetts Press, 1988; pg. 201. 1 2 3 4 5 6 7 8 Howard Quint, The Forging of American Socialism: Origins of the Modern Movement: The Impact of Socialism on American Thought and Action, 1886–1901. Columbia, SC: University of South Carolina Press, 1953; pg. 74. ↑ Joseph Schiffman, "Edward Bellamy's Religious Thought", Transactions and Proceedings of the Modern Language Association of America, vol. 68, no. 4 (Sep. 1953), pg. 716. ↑ Quint, The Forging of American Socialism, pp. 74–75. ↑ Arthur E. Morgan, Edward Bellamy. New York: Columbia University Press, 1944; pp. 148, 252. ↑ Edward Bellamy, "Why I Wrote Looking Backward," The Nationalist, vol. 2 (1890), pg. 199. ↑ William D.P. Bliss and Rudolph M. Binder (eds. ), The New Encyclopedia of Social Reform. New Edition. New York: Funk and Wagnalls, 1908; pp. 810–812. ↑ Morris Hillquit, History of Socialism in the United States. Fifth Revised and Enlarged Edition. New York: Funk and Wagnalls, 1910; pg. 289. ↑ Sylvia E. Bowman, The Year 2000: A Critical Biography of Edward Bellamy. New York: Bookman Associates, 1958; pg. 114. ↑ Bellamy to Howells, June 17, 1888, quoted in Bowman, The Year 2000, pg. 114. ↑ Arthur Lipow, Authoritarian Socialism in America: Edward Bellamy and the Nationalist Movement. Berkeley, CA: University of California Press, 1982; pg. 30. ↑ Lipow, Authoritarian Socialism in America, pg. 31. ↑ "A Noted Writer's Abode: The Home of Edward Bellamy at Chicopee Falls, Mass. ", Harrisburg [PA] Telegraph, July 19, 1890, pg. 4. Six to One: A Nantucket Idyl. New York: G.P. Putnam's Sons, 1878. Dr. Heidenhoff's Process. London: William Reeves, 1880. Miss Ludington's Sister: A Romance of Immorality. Boston: James R. Osgoode and Co., 1885. Looking Backward, 2000–1887. Boston: Houghton, Mifflin Co., 1889. "How I Came to Write Looking Backward", The Nationalist (Boston), vol. 1, no. 1 (May 1889), pp. 1–4. Plutocracy or Nationalism - Which? Principles and Purposes of Nationalism: Edward Bellamy's Address at Tremont Temple, Boston, on the Nationalist Club's First Anniversary, Dec. 19, 1889. Philadelphia: Bureau of Nationalist Literature, n.d. . The Programme of the Nationalists. Philadelphia: Bureau of Nationalist Literature, 1894. —First published in The Forum, March 1894. Equality. New York: D. Appleton & Co., 1898. The Blindman's World and Other Stories. William Dean Howells, intro. Boston: Houghton, Mifflin and Co., 1898. The Duke of Stockbridge: A Romance of Shay's Rebellion. New York: Silver, Burdett and Co., 1900. Edward Bellamy: Selected Writings on Religion and Society. Joseph Schiffman (ed.) New York: Liberal Arts Press, 1955. Apparitions of Things to Come: Edward Bellamy's Tales of Mystery & Imagination. Franklin Rosemont, ed. Chicago: Charles H. Kerr Publishing Company, 1990. Sylvia E. Bowman, Edward Bellamy Abroad: An American Prophet's Influence. New York: Twayne Publishers, 1962. Sylvia E. Bowman, The Year 2000: A Critical Biography Of Edward Bellamy. New York: Bookman Associates, 1958. John Dewey, "A Great American Prophet", Common Sense, April 1934, pp. 1–4. Everett W. MacNair, Edward Bellamy and the Nationalist Movement, 1889 to 1894: A Research Study of Edward Bellamy's Work as a Social Reformer. Milwaukee, WI: Fitzgerald Co., 1957. Arthur E. Morgan, Edward Bellamy. New York: Columbia University Press, 1944. Arthur E. Morgan, The Philosophy of Edward Bellamy. King's Crown Press, 1945. Daphne Patai (ed. ), Looking Backward, 1988–1888: Essays on Edward Bellamy. Amherst, MA: University of Massachusetts Press, 1988. Jean Pfaelzer, The Utopian Novel in America, 1886–1896: The Politics of Form. Pittsburgh, PA: University of Pittsburgh Press, 1985. Elizabeth Sadler, "One Book's Influence: Edward Bellamy's Looking Backward" New England Quarterly, vol. 17 (Dec. 1944), pp. 530–555. Robert L. Shurter, The Literary Work of Edward Bellamy", American Literature, vol. 5, no. 3 (Nov. 1933), pp. 229-234. Ida M. Tarbell, "New Dealers of the 'Seventies: Henry George and Edward Bellamy", The Forum, vol. 92, no. 3 (Sept. 1934), pg. 157. John Thomas, Alternative America: Henry George, Edward Bellamy, Henry Demarest Lloyd and the Adversary Tradition. Cambridge, MA: Harvard University Press, 1983. Richard Toby Widdicombe, Edward Bellamy: An Annotated Bibliography of Secondary Criticism. New York: Garland Publishing, 1988. Frances E. Willard, "An Interview with Edward Bellamy", Our Day, vol. 4, no. 24 (Dec. 1889), pp. 539–542.